BLE packet Protocol Data Unit (PDU) size in specification v4.0 and v4.1 is 2-39 bytes. To see where/how advertising and data channel packets are used in BLE communications, please visit the Discovery and Connections pages. 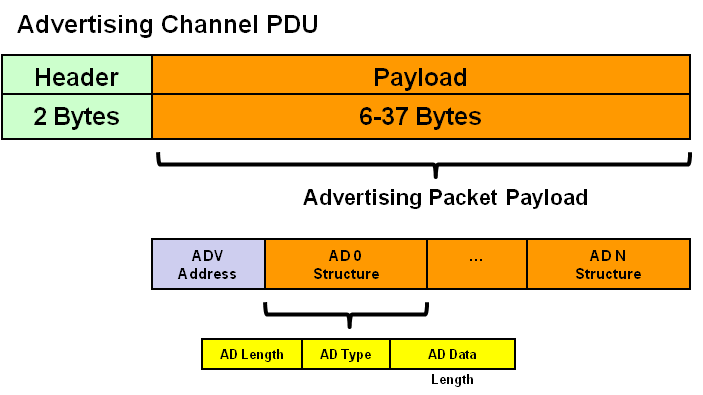 This packet type supports connectable, undirected advertising and is used when a slave/peripheral device is powered up for the first time (i.e. has never connected with a master) and is looking to connect with any node (it's promiscuous). This typically represents a factory default state. Typically, ADV_IND packets contain the Complete Local Name (Type id 0x09) and 128-bit Service UUID (Type id 0x07). A single 128-bit UUID consumes 16/29 of the bytes available in the ADV_IND payload. If you need to send more advertising data, consider initializing and enabling SCAN_RSP packets in your application. This packet type supports connectable, directed advertising and would typically be used after a slave/peripheral has connected with a master/central. It is not looking to be discovered, rather, it already has the device address of its peer and wishes to re-connect quickly to a specific master/central device. Only one Master/Central device (with matching MAC address) will receive/pass ADV_IND_DIRECT messages to its application layer. The Link Layer exits this advertising state after 1.28 s. If no Central responds, the Advertiser will need to re-trigger this advertising mode. The Master/Central device must be in the SCANNING state to detect ADV_DIRECT_IND advertising packets. In BLE v4.0 and v4.1 the maximum ATT Parameter+Payload size is 22 bytes.